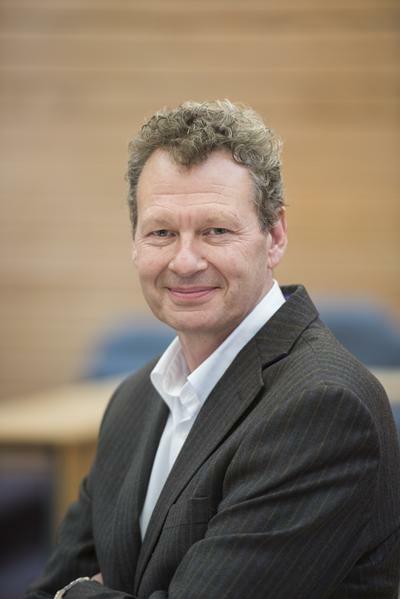 Professor Tim Elliott left the University of Oxford with a first in Biochemistry in 1983, received a PhD from the University of Southampton in 1986 and completed his postdoctoral training at MIT. He held a lectureship and later a professorship in immunology (Weatherall Institute for Molecular Medicine and Balliol College, University of Oxford) between 1990-2000 before being appointed to the Chair of Experimental Oncology, School of Medicine, University of Southampton. He was Associate Dean (Research) for the Faculty of Medicine between 2005 and 2015. He’s held appointments on Scientific Advisory boards at the Wellcome Trust, the Association of International Cancer Research, Leukaemia and Lymphoma Research, and Symphogen, and currently chairs the CRUK Expert Review Group for Cancer Immunology He has published over 130 papers (h-index, 48) in the field of molecular immunology; was visiting lecturer of the Alberta Heritage Foundation for Medical Research, University of Edmonton, Alberta in 1999; and recently held a visiting Professorship at the Netherlands Cancer Institute, Amsterdam. He is a fellow of the Royal Society of Biology and in 2014 he was elected to the Academy of Medical Sciences. Professor Elliott was amongst the key group of immunologists who developed studies of antigen presentation at the molecular level during the 1980s, undertaking a series of studies to determine and define the immunostimulatory properties of MHC Class I molecules and elucidating the molecular mechanisms of co-factor assisted peptide loading of MHC Class I in antigen presenting cells: work considered to be the fundamental foundation of much of the recent work on antigen presentation. The work underpins rational T-cell based vaccine design and continues to fuel translational research in Southampton where discoveries in the areas of antigen discovery, T cell regulation and immunodominance are making a significant impact on new and ongoing cancer immunotherapy trials. His mechanistic studies have always benefitted from an active interface with the physical sciences including collaborations with synthetic and computational chemistry and recently with Microsoft UK. He developed a 4 year integrated PhD programme in Biomedical Science which is now in its eleventh year. He led the RAE2008 and REF2015 submissions for the school of medicine, and has taken a leading role in developing the new cross-faculty, interdisciplinary Institute for Life Sciences which he is now Deputy Director of. Cytotoxic T cells (CTL) are an important arm of our immune defence against intracellular pathogens such as viruses, bacteria and parasites and can provide protection against the development of tumours. 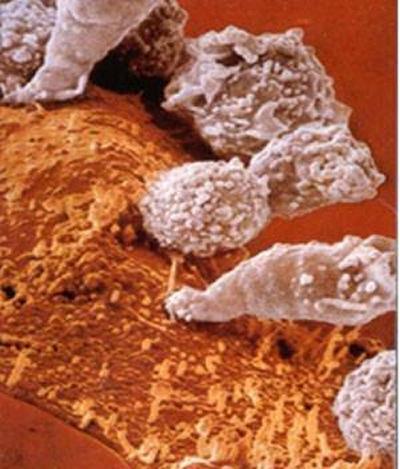 The picture to the right shows a swarm of CTL (coloured in white) attacking a tumour cell (coloured in orange). The outcome of this attack will be the destruction of the tumour cell. CTL recognise fragments of protein antigens (epitopes), derived from pathogens or tumours, bound to polymorphic receptor molecules encoded by the Major Histocompatibility Complex (class I) on the surface of infected cells. In the endoplasmic reticulum, class I MHC molecules are assembled with antigenic peptides while they are bound to a number of other proteins. These include both class I MHC-specific cofactors (TAP and tapasin) and cofactors with more general functions (calreticulin and ERp57). We have shown that the failure of class I molecules to interact with all of these cofactors results in the assembly of unstable class I heavy chain: beta-2 m dimers which are released into the secretory pathway before they have acquired an optimal peptide ligand and are functionally useless. Our experiments have also suggested that the loading of class I molecules is a two-stage process that involves an initial assembly step with low affinity, non-stabilising peptides followed by an optimisation step involving the intracellular cofactors tapasin, calreticulin and ERp57. We have shown that tapasin is the primary editor of the peptide repertoire presented by MHC class I molecules and are currently pursuing its precise molecular mechanism using a combination of molecular dynamics modeling, molecular systems biology (a collaboration with A Microsoft Research and NMR (a collaboration with Joern Werner at the School of Biological Sciences along with standard biochemical techniques. We are investigating the importance of tapasin editing in establishing immunodominance in vivo, and are now able to relate the intracellular loading process to cytotoxic T cell responses to vaccine-encoded epitopes. These experiments identify tapasin as a potential pharmacological target for modulating the specificity and intensity of immune responses to vaccines. Other Collaborators include: Jim Kaufman, University of Cambridge, UK; Louise Boyle, University of Cambridge; Brian Baker, Notre Dame University, USA; Tom Hanke, University of Oxford; Andy Sewell, University of Cardiff; Adrian Hayday, Crick Institute and Kings College London; Paul Bowness, University of Oxford; Joern Werner, University of Southampton; Neil Dalchau and Andrew Phillips, Microsoft UK, Cambridge; Peter Coveney, University College London. . The Cell Biology of MHC class I assembly. Williams A, Peh C A and Elliott T. (2002). Tissue Antigens. 59: 3-17. The Cell Biology of MHC class I assembly: Towards a molecular understanding. Van Hateren A, Bailey A, Elliott T. (2010). Tissue Antigens 76(4):259-75. The complex Route to MHC class I-Peptide complexes. T Elliott and J Neefjes. (2006). Cell 127: 249-251. The 'chop-and-change' of MHC class I assembly.Elliott T. (2006). Nat Immunol. Jan;7(1):7-9. The processing of antigens delivered as DNA vaccines. Howarth M and Elliott T (2004) Immunol Rev. 199:27-39. Plasticity of empty major histocompatibility complex class I molecules determines peptide-selector function. Van Hateren A., Bailey A., Werner J.M. and Elliott T.J. (2015) Mol Immunol. Mar 26. pii: S0161-5890(15)00114-5. The role of ERAP1 polymorphism in disease.In 1996, along with Yewdell’s group, I was the first to demonstrate N-terminal trimming of epitope precursors in the ER. In 2002 the Shastri lab at UC Berkeley discovered the enzyme responsible, ERAAP (in the mouse) . In partnership with Dr. Edd James (Faculty of Medicine), who came to Southampton from the Berkeley lab, we have identified over 30 . naturally occurring ERAP1 allotypes from individuals and patients with autoinflammatory diseases. We have shown that ERAP1 allotypes have one of three generic activities (efficient, hypo- and hyper-functional) based on the precise substrate specificity of each allele highlighting the importance of ERAP1 alleles in the generation of the peptide repertoire. Improtently, we have found that in ankylosing spondylitis, although individual SNP do not predict specificity well, particular combinations of ERAP1 protein alleles do. We are now investigating ERAP1 variation as a risk factor for cervical carcinoma as well as other autoinflammatory diseases such as multiple sclerosis and psoriasis. Given the importance of this enzyme in generating the peptidome from which the Tapasin:MHC complex selects the ligandome for presentation at the cell surface; we are investigating how allelic variation in ERAP function affects immune responsiveness to cancer antigens and autoantigens in the context of disease. Collaborators include: Paul Bowness, University of Oxford; Stratos Stratikos, Athens, Greece; Joern Werner, Southampton; Neil Dalchau, Microsoft Research UK; Peter Coveney, University College London. Key review: ERAP1 in the pathogenesis of ankylosing spondylitis. Reeves E., Elliott T.J., James E and Edwards C.J. Immunol Res. 2014 Dec;60(2-3):257-69. Immunological defence mechanisms that are normally thought to protect us from infections are now also thought to eliminate unwanted cells in the body, particularly those that are unable to stop proliferating (e.g. tumour cells). This is a form of reactivity towards "self" called autoimmunity. Excessive activation of self-reactive immune cells can lead to a pathological condition called autoimmune disease where the otherwise helpful destructive powers of the immune system become aberrantly focussed on normal, healthy cells in the body. The way in which self-reactive immune cells are controlled, and in particular, how potentially dangerous reactivities are suppressed in healthy individuals is largely unknown. Recently, a population of suppressor immune cells (called regulatory T cells or Tregs) has been identified that seems to keep some kinds of autoimmune disease at bay in experimental mice. We have shown that the same population of cells prevents experimental mice from staging an immune attack against tumour cells so that when we get rid of them, these mice are able to protect themselves against the growth of a transplantable tumour. We have also found that the immune response generated in these mice is broader that that generated with other more conventional anti-tumour vaccines and results in protection against a wide variety of experimental tumours from colon cancer to lymphoma. We have identified the epitope recognized by cross-protective cytotoxic T cells primed in the absence of Treg and are currently investigating the immunological basis of the differential suppression we see in tumour bearing mice. We are interested in learning why cytotoxic T cells under such profound suppression are so good at fighting cancer, and whether they share a common feature that we can use to identify human cancer patients that would benefit from their re-activation. Due to the therapeutic potential of “de-suppressed” cytotoxic T cells recognising such “cryptic” epitopes, we are investigating ways in which they can be reactivated in preclinical models. Collaborators include: Christian Ottensmeier, Southampton UK; Vijay Pandanguran, LaJolla, USA/ Southampton, UK.. The influence of CD25+ cells on the generation of immunity to tumour cell lines in mice. Jones E, Golgher D, Simon K., Dahm-Vicker M, Screaton G, Elliott T and Gallimore A. (2004). Novartis Found Symp. ;256:149-52; discussion 152-7, 259-69. We usually have space for 1-2 graduate students each year. If you are interested in our work and would like to find out about doing postgraduate research in my lab, begin your enquiries well in advance. It would help to contact me for an informal chat in the early months of your final year at University. Cancer is not usually an infectious disease, but in some cases tumour cells acquire the ability to pass between individuals in a population. We are particularly interested in the two contagious cancers that circulate in the Tasmanian devil population, DFT1 and DFT2. Our research is focused on why and how the MHC system ‘breaks down’ in the case of contagious cancers. James, E., Reeves, E., Colebatch, A. N., Elliott, T., & Edwards, C. J. (2013). Functionally distinct ERAP1 haplotype combinations define individuals with Ankylosing Spondylitis (P5047). Journal of Immunology, 190(111.6). Van Hateren, A., Bailey, A., & Elliott, T. (Accepted/In press). The cell biology of MHC class I assembly: towards a molecular understanding. Tissue Antigens. Purcell, A. W., & Elliott, T. (2008). Molecular machinations of the MHC-I peptide loading complex. Current Opinion in Immunology, 20(1), 75-81. Golgher, D., Korangy, F., Gao, B., Gorski, K., Jaffee, E., Edidin, M., ... Elliott, T. (2001). An immunodominant MHC class II-restricted tumor antigen is conformation dependent and binds to the endoplasmic reticulum chaperone, calreticulin. Journal of Immunology, 167(1), 147-155. Norbury, C. C., Princiotta, M. F., Bacik, I., Brutkiewicz, R. R., Wood, P., Elliott, T., ... Yewdell, J. W. (2001). Multiple antigen-specific processing pathways for activating naive CD8+ T cells in vivo. Journal of Immunology, 166(7), 4355-4362. Jones, E., Golgher, D., Simon, A. K., Dahm-Vicker, M., Screaton, G., Elliott, T., & Gallimore, A. (2004). The influence of CD25+ cells on the generation of immunity to tumour cell lines in mice. 149-152. Paper presented at Symposium on Cancer and Inflammation, . Lectures in Antigen Processing and presentation to undergraduate Medical Students (BM3019) and Biological Scientists (BS3037).